For some, Labor Day is a day to reflect on the creation of the labor movement and think about the social and economic achievements of American Workers, for others, it’s about finding the best labor day deal on a laptop. If you’re in the latter camp, then you’re on the right track. We’ve found the best labor day laptop deals for gaming, college, business, battery life and Chromebook and compiled them into one top 5 list for your convenience. Whether you are looking for impressive specs for gaming, a laptop with good battery life to cope with your college classes or just a budget Chromebook for web browsing, you’ve come to the right place. Asus has really lived up to their Republic of Gamers title with the WH71(WX) gaming laptop. At the time of writing, the WH71 is the only laptop under $1500 that fits a Nvidia GeForce GTX980M into its specs, making it a value-for-money colossus. That in its own right is enough to award this laptop the #1 Gaming Laptop spot, but I take it people are interested in the other impressive specs too! Under the hood, you’ll find an Intel Core i7-4720HQ 2.6GHz processor, which also happens to be the fastest CPU in this sub $1500 price range too. Add 16GB of DDR4 RAM into the mix and you get a truly impressive (and fast) gaming laptop. For quick boot times and a boost to your gaming load screens, the included 128GB SSD is a welcome addition. Add in a 1TB 7200RPM hard drive for all your storage and you’ve got a nice little setup. Games look fantastic on the 17.3” Full HD IPS display in 1920 x 1080 resolution. The IPS (in-plane switching) panel improves viewing angles and color reproduction for the best possible picture. The WH71 has a stealthy, almost futuristic look from behind with its metallic red vents aimed to direct heat away from the laptop for those intense gaming sessions. It’s otherwise attractive, with rounded edges, a matte black look and a brushed aluminum plate on the lid. A red backlit keyboard and ROG insignia give us the signature gaming feel. The downside of having a laptop with fantastic specs is the trade-off of battery life and weight, good components are often bigger and more power hungry than their budget counterparts. This is apparent in the G751JY, with an average battery life of around 3.5 hours and a weight of 8.4 lbs. With this in mind, this laptop is much more effective as a desktop replacement and if you forget your charger at home you may as well kiss goodbye to your battery charge! Ports include 4x USB 3.0, 1x Thunderbolt 2, 1x HDMI, 1x VGA/Mini D-Sub, 1x SPDIF, 1x Headphone-out, 1x Mic-in ports as well as a Gigabit Ethernet port and Gigabit Wifi adapter. The thought of starting college is a little much for some, the fear of the unknown, not knowing what to expect, will you make friends? Choosing a laptop doesn’t need to be an additional thing for you to worry about, which is why we’ve gone ahead and chosen the best laptop for college so you don’t have to! With this criteria in mind and lots of research, we finally chose the winner. 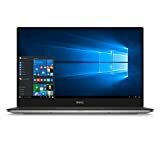 The Dell XPS 13 9350-1340SLV. The XPS manages an outstanding 11 hours and 54 minute battery life which means you can take it to classes without carrying around a charger all day. Its keyboard is backlit with two settings, feels very responsive and is really nice to type on. The touchpad has a lovely click feel when you press the buttons and is also responsive. At just 2.8 lbs, the XPS 13 is super light, meaning you will have no trouble carrying it around with you all day, every day. This laptop is no slouch in the specs department either, with an Intel Core i5-6200U 2.5GHz processor providing the grunt. It also comes with an adequate 8GB of RAM, and 128GB of SSD storage for speedy boot times and responsiveness. Intel HD Graphics 520 acts as the onboard graphics card. The screen is 13.3” inches but Full HD with a 1920 x 1080 resolution, giving you plenty of real estate to multi-task with different documents and college work. Looks wise, the XPS is very appealing. The laptop itself is very thin at just 12 x 7.9 x 0.6 inches with a silver aluminum brushed base and lid. The keyboard and surrounds have a carbon-fiber look and the screen features an almost nonexistent “infinity edge” bezel. The XPS can be had for under $900, making it well within the price range of a typical college student, and you can be rest assured that the laptop will make it through all of your college years due to its durability. Ports include, 1 x USB 3.0, 1 x USB 2.0, 1 x Thunderbolt, SD Card Reader, 802.11ac Wifi Adapter, Headphone/Microphone Jack. Gone are the days where you have to go into work and use a laptop that is slow and painful to use, making you hold your head in your hands more than once a day. We’ve managed to find a speedy and durable laptop that is good to type on for an affordable price. Enter the Lenovo Thinkpad T460. Widely renowned for their business laptops, Lenovo has again produced a quality offering in the T460. The Thinkpad T460 is military specced, passing multiple tests for ruggedness, durability and quality against a number of different parameters. An impressive 8.5-hour battery life means you can take the laptop around with you during a full day of meetings without charging it. The T460 has an Intel i5-6300U 2.4GHz CPU, as well as 8GB of RAM that enables you to effectively multi-task with a bunch of different programs. A 192GB SSD ensures your laptop will be snippy and responsive and have speedy boot times. A 14” Full HD IPS 1920 x 1080 display impressively shows a range of colors vividly, whilst the IPS panel allows a wider viewing angle, perfect for showing co-workers something on your laptop. Included is a 720P in-built webcam for any video conferences you may have. Weighing in at just 3.8 lbs, the T460 is light enough to carry around from meeting to meeting without any strain or discomfort. Ports include, 2 x USB 3.0, 1 x DisplayPort, 1 x HDMI, Headphone and Microphone Jack, SD Card Reader, Bluetooth 4.1, Wifi 802.11ac Adapter, Ethernet Adapter. If you’re looking for a laptop with the longest possible battery life, then you can’t go past the Lenovo Thinkpad X260. Due to Lenovo’s Power Bridge Technology that allows you to hot-swap batteries without shutting the computer down, Lenovo claims that you can get over 25 hours of continuous battery life by hot swapping the internal 3-cell battery with an external 6-cell (72Wh) battery. Testing done without the external battery, just using the internal 3-cell front and rear batteries reached a peak battery life of 17 hours and 14 minutes. Testing was done doing continuous web surfing with a brightness of 100 nits. With the impressive battery life comes a decent suite of specs, the Intel Core i5-6300U 2.4GHz CPU definitely no slouch, whilst 8GB of RAM ensures you can multi-task without any issues. Additionally, the X260 comes with in-built Intel HD 520 graphics, a speedy 256GB SSD hard drive and 12.5” 1366×768 display. As with most Lenovo laptops, the X260 is tested to military specifications, which validates the ruggedness, durability, and quality of the laptop. Weighing in at 3.2lbs, the X260 is light enough to carry around with you all day. Thew X260 retains the traditional black Lenovo look and has a fantastic keyboard for long typing sessions. Whilst being a little bit bulky, the laptop is incredibly durable. Ports include, 3 x USB 3.0, 1 x Mini DisplayPort, 1 x HDMI, 4-in-1 Card Reader, Ethernet Port, Microphone/Headphone Jack, Bluetooth Adapter, Wifi 802.11ac Adapter. If you’re looking for a basic laptop that gets the job done without all the bells and whistles and cost, then you might be after a Chromebook. The pick of the bunch is the Toshiba Chromebook 14. The Toshiba manages an impressive 10-hour battery life to keep you going even without a charger in tow. Possibly the biggest highlight of the laptop is the display that you get for such a good price. The Chromebook 2 has a 14” Full HD display with an IPS panel which has excellent color reproduction and wider viewing angles than traditional panels. The screen has a fantastic brightness level, higher than most Chromebooks on the market. As Chromebooks are typically cloud-based, meaning your documents etc. are mainly stored online with Google Drive, Microsoft OneDrive etc. specs aren’t such a big deal with Chromebooks. The Toshiba has an Intel Celeron N3160 1.7GHz CPU, 4GB of RAM and a speedy 32GB SSD hard drive. The keyboard is backlit and fantastic to type on for daily use. The Chromebook has a basic all-silver design which is attractive and fairly basic, but at 8.4 x 12.6 x 0.8 inches it’s very thin and weighing 2.9 lbs is easily able to be carried around for extended periods. Ports include, 1 x USB 3.0, 1 x USB 2.0, 1 x HDMI, SD Card Reader, Headphone/Mic Jack. We’ve found the best labor day laptop deals for gaming, college, business, battery life and Chromebook and compiled them into one top 5 list for your convenience.